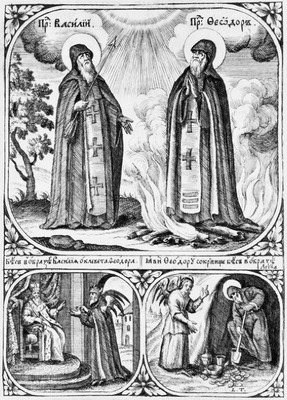 The Hieromartyrs Theodore and Basil of the Caves pursued asceticism in the eleventh century in the Near Caves of Kiev. Saint Theodore distributed his riches to the poor, went to the monastery and settled into the Varangian Cave, adjoining the Caves of Saint Theodosius. He dwelt here many years in strict temperance. When the enemy aroused sorrow in him for giving away his possessions, Saint Basil comforted him: “I implore you, brother Theodore, do not forget the reward. If you want to have possessions, take everything that is mine.” Saint Theodore repented and dearly loved Saint Basil, with whom he lived in the cell. Once, Saint Basil was on an errand outside the monastery for three months. The devil, having assumed his form, appeared to Saint Theodore and indicated that there was a treasure hidden somewhere in the cave by robbers. The monk still wanted to leave the monastery to buy possessions to live in the world. When Saint Basil returned, the demonic illusion disappeared. From that time, Saint Theodore started to be more attentive to himself. In order not to be distracted by idle thoughts during moments of inactivity, he set up a millstone, and by night he ground grain. Thus, by long and zealous ascetic action he freed himself from the passion of avarice. A report reached Prince Mstislav Svyatopolkovich that Saint Theodore had found much treasure in the cave. He summoned the monk to him and commanded him to show him the spot where the valuables were hidden. Saint Theodore told the prince that indeed he had once seen gold and precious vessels in the cave, but fearing temptation, he and Saint Basil had buried the treasure, and God took from him the memory of where it was hidden. Союзом любве связавшеся, преподобнии,/ всяк союз козней вражиих попрасте,/ страдание же и смерть неповинне/ от сребролюбиваго князя претерпесте добле,/ тем молим вас, вкупе поживших/ и венцы мучения приемших,/ молитеся Господеви о нас,/ яко да во мнозей любви, вере и надежди добре поживше,/ всегда ублажаем вас,/ Феодоре и Василие добропобеднии. Добр советник явлься блаженному Феодору,/ Богомудре Василие,/ избавил еси того советом своим от прелести диаволи/ и ко свету богоразумия наставль./ С темже послежде блаженную приял еси кончину,/ устрелен неправедно быв во утробу от сребролюбиваго князя./ И ныне, предстоя Господеви,/ молися непрестанно о всех нас.